Being fancy at Angelina | gingerbread smiles. 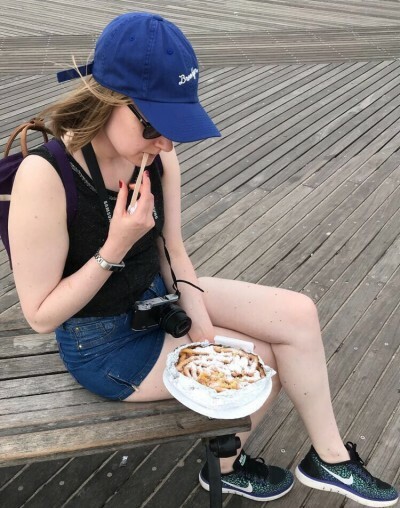 Before we jetted off to Paris I'd been researching where we should visit, what we could see and most importantly, where we would eat. One place came up that I knew we HAD to visit. 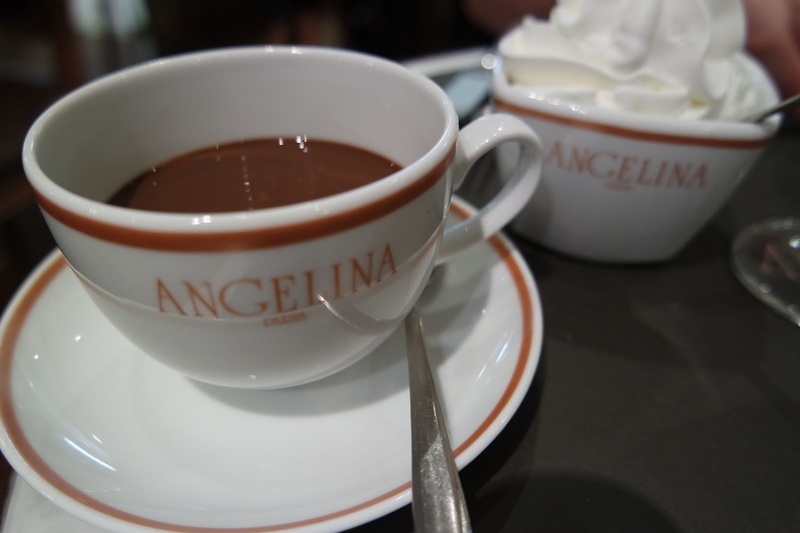 Boasting amazing cakes and desserts as well their infamous hot chocolate, Angelina was high on my list of places to visit. 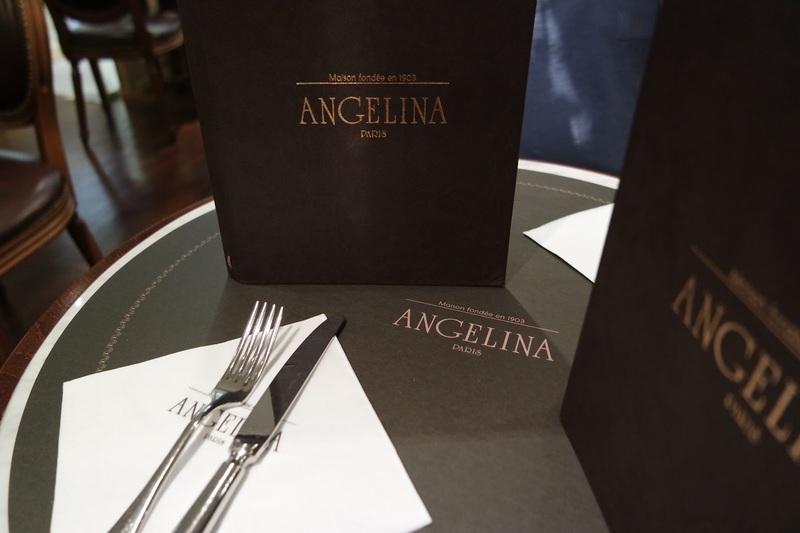 I'd first come across Angelina whilst browsing places to eat in Paris over on Andrea's blog. She raved about their thick, luxurious African hot chocolate. As I'd heard Anglina was a popular place with queues out the door on most occasions I decided to book us a slot before we landed in Paris. This was super easy and could be done through their website. 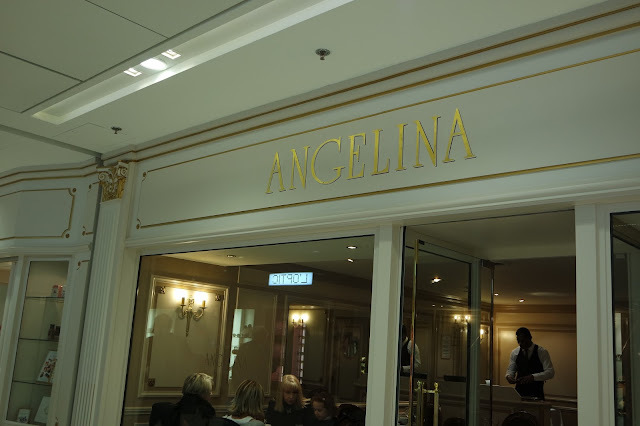 There are two Angelina's in Paris, one which I think most people will know about as it's not far from the Louve and another which is a little out of the main centre within a shopping centre. Without knowing which was which when I booked, I decided to look at the map and book the one closest to our hotel. That happened to be Porte Maillot which was located about 10 minutes from the Arc De Triomphe in a very fancy quaint little shopping centre. When we arrived it was very quiet, a real contrast from the other Angelina we'd past the day before. Although we were early for our reservation we were sat down and given our menus. As we were here for a late lunch we browsed through their food selection knowing that ultimately my beverage of choice was going to be hot chocolate. 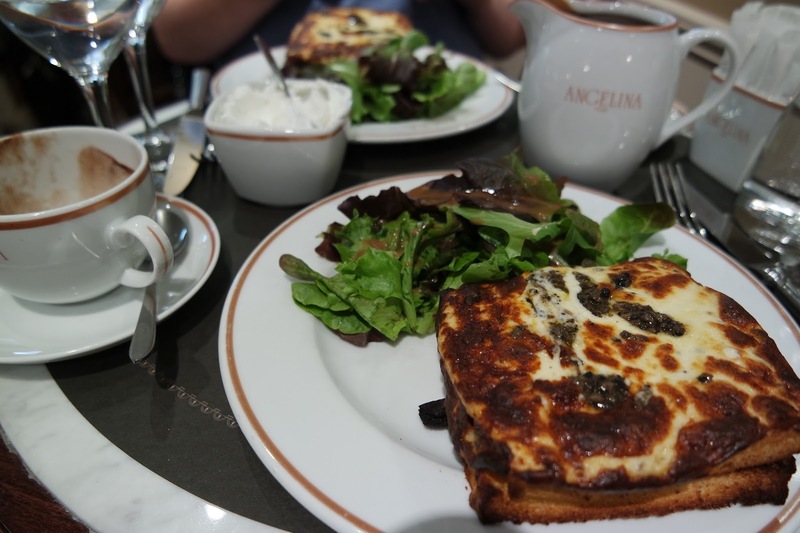 They had a good selection of lunch options, although not extensive, and in the end I decided to go with a french classic, Croque Monsieur with truffle oil. Different to the usual ham and cheese, this one contained chicken which was a lovely change up. It arrived very swiftly with a nice fresh side salad. Now the hot chocolate. When this arrived we had our two tea cups, a bowl full of fresh cream and a jug of the good stuff. The lady poured out our hot chocolate and then we tucked in. The hot chocolate was VERY rich and oh so dark it was a little bitter. I definitely enjoyed my first cup and mixed in a bit of the fresh cream to take the edge off. After I'd finished my lunch I went in for a second cup. The lady kindly warmed up our jug of hot chocolate as it had gone cold during our meal. She then poured us both out the remains (no time for a pouring shot which saddened me greatly) and we began sipping again. Now this hot chocolate is amazing but after a while it can get very sickly and samey so unforutnaly I didn't manage all of my second cup. I think this is a treat to be enjoyed but one cup will do! After our food we were so full that we didn't get chance to try a dessert even thought they looked STUNNING. Now that I'm back in the UK I'm disappointed we didn't just get one and put ourself through the pain of being stuffed just so we could have tried one. Oh well will have to find another way to try these pieces of beauty. So overall I wouldn't definitely say to visit. This place is classy and backs itself up with great food, dessert and hot chocolate. It's a little pricy but when you are in Paris you want the best, am I right? 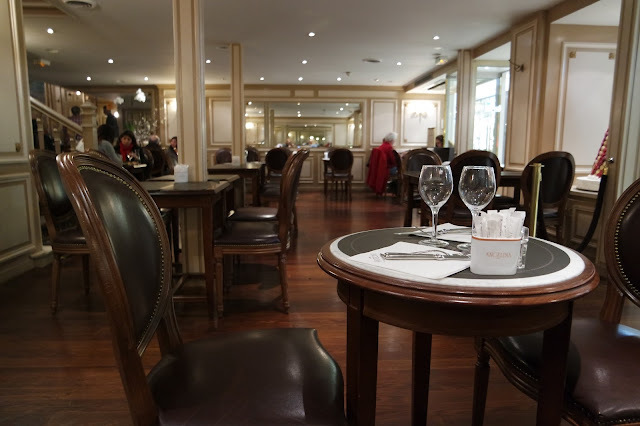 Also my biggest tip, go to Angelina Porte Maillot! It may not be the fanciest one in the best location but it's quiet, easy to get to and still serves up everything the other does. 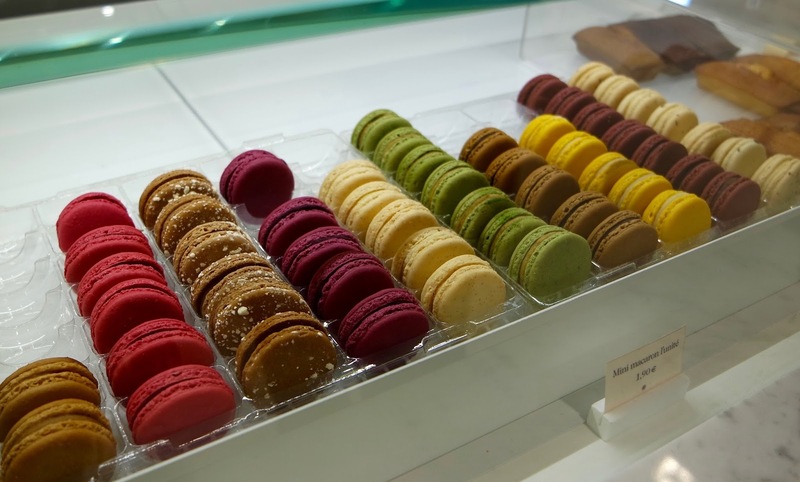 It also has a takeaway part to it where you can buy their hot chocolate, cakes and macarons. Its definitely a hidden gem. 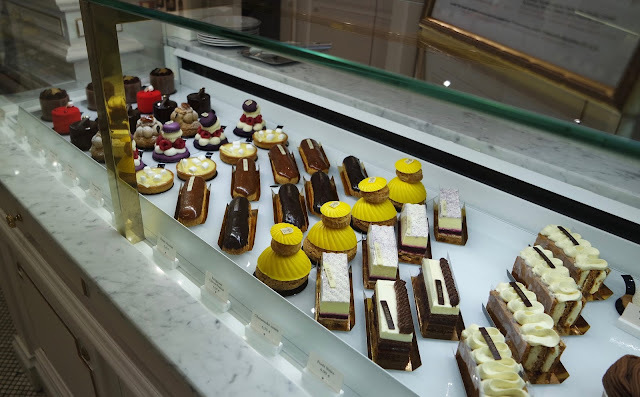 I've definitely got this on my list next time I visit Paris - even if it isn't all that, I think I need one of those cakes!